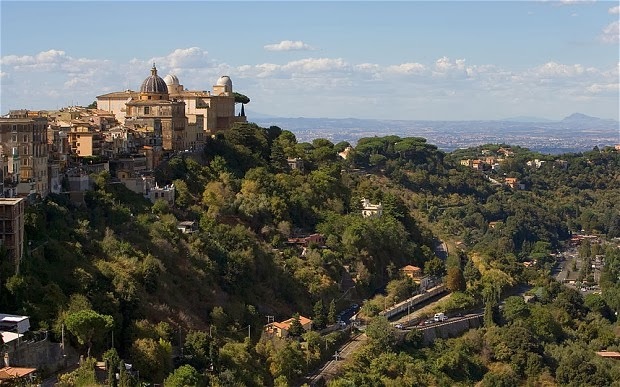 Pope Francis has announced that from this month the gardens of his summer residence at Castel Gandolfo will be open to the public. The rarely used castle and surrounding 55 hectare estate are situated in the Alban hills about 20 miles from Rome and include ornamental gardens, terraces with sea views, the remains of an imperial Roman villa and a small farm that supplies the Vatican with milk and butter as well as eggs, honey, and olives. Then tradition of this summer refuge from the heat and chaos of Roma was initiated by Pope Clement VII in the 16th century when he seized the castle and grounds from the Savelli family in lieu of unpaid debts. Pope Benedict XVI also used to spend his summers there as well as a brief period of time just after he stepped down from the papacy in 2013. Pope Francis however has indicated that he would rather work on his campaign and remain in Rome than continue the tradition. The spectacular view of lake Albano from the property has inspired many artists including Corot and Turner and there a numerous stunning religious works of art within the complex and a fountain by Bernini graces the piazza facing the apostolic palace. The gardens will be open every morning from Monday to Saturday with tickets costing 26 euro each. Guided visits in a variety of languages can be booked through the website of the Vatican Museums.